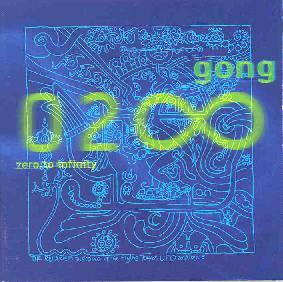 Gong - "Zero to Infinity"
'Zero the hero' returns to Earth from Ze Planet Gong via his Teapot Taxi, after years of drifting lost in space seemingly for an infini-tea. Awright, you know the spiel. A true trilogy Gong album followup at long last. Actually, in a bit of bizarre revisionism (it was never before suggested as such to my knowledge), the liner notes suggest that 'Zero to Infinity' is the 'fifth' in the Radio Gnome Invisible epic, with the 'Shapeshifter' album being the fourth. Hmmmm.... I don't buy it. That was a good album, with Graham Clark's violin subbing nicely for Didier's sax, but it was neither strongly connected to the story nor particularly single-themed. With a core band lineup of Daevid Allen (g,v), Gilli Smyth (v), Mike Howlett (b), Theo Travis (sax/flt/kb), and Chris Taylor (d), I'd say we have a very capable classic-type Gong in hand. Though because Didier Malherbe (Bloomdido Bad de Grasse) only makes a token appearance (playing on just two tracks), it could have been more ideal. The old songcraft comes immediately to light with "Magdalene," embracing the same goofy jazzified riffing as we've all learned to love over the years, and then the obligatory space-bliss bridge section - though here it's more a 'calypso' groove (for lack of a better term). A very promising beginning. The "Invisible Temple" is a three-part extravaganza, also well done... in a sense very much like what you'd hear on 'Angel's Egg,' but then again we hear the first of Allen's surprisingly fresh lead guitar excursions - this one is full of strange wails, noises, and runs. His guitar screams out even moreso on "Zeroid," one of the more quirky, disjointed works that I still haven't entirely absorbed yet. Later on, "Bodilingus" is even stranger, a wildly off-beat number with Allen ranting on about his decomposing body... the ever-present eccentric side of Gong! Revisiting lyrics Allen wrote back in 1969, "Wise Man in Your Heart" is obviously a tune that's been in waiting for many years, as Pierre Moerlen is given writing credit. This is classic Gong as it should be...an awesome bassline and a cool space-drone backdrop. "Tali's Song" is another big winner, this time using lyrics from 1980. The base tune is an intelligent 3/4 proggy composition, Allen here showing a lighter touch on the guitar and he's in fine voice to boot. The typical instrumental groove-jam "Infinitea" wraps up the album, an African-flavored rhythm colored with the usual mix of gliss-guitar and Travis' sax soloing. 'Zero to Infinity' is by no means a disappointment, and I'd say it belongs in everyone's collection. But I don't experience the same level of transcendence listening to this album as compared to the original trilogy. I think it's mainly because Theo Travis' sax/flute playing, while every bit as technically proficient, just isn't as magical and colorful as Bloomdido's performances. So if this album were brought to PBS' Antiques Roadshow, the appraiser would say the equivalent of, "Well, the signature says Tiffany, but it's really a reproduction." But a damn good reproduction - it took an expert to tell the difference. So, here we have an album of great new songs by a great old band that will soon come to a stage near you to perform them live with the proper spirit and magic that I didn't feel was entirely captured on this recording. It should be fabulous.